Invite delicate butterflies to visit your yard with the Coveside Small Butterfly House. Placing a butterfly house in your garden offers these lovely insects a safe shelter in wind and rain, and some may use it for hibernating through the winter. The significant overhang on the roof of this home keeps water from entering it, and drainage gaps in each corner on the base help the interior stay dry. The five oval slots are designed specifically for butterflies to enter, and a side panel opens for easy cleaning and maintenance. The natural, eastern white pine construction adds a rustic look to the piece, and weathers beautifully outdoors. Attach this home to a post using the metal hanger and support hole on its back, for a stable shelter. 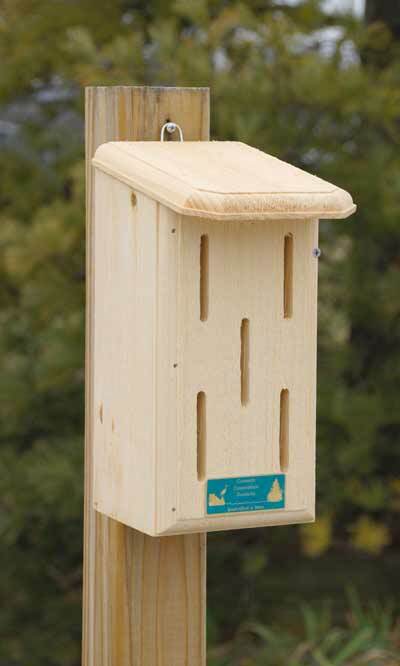 Help protect butterflies from the elements by placing this Small Butterfly House in your yard. Made in the USA. Temporarily out of stock. Available soon.